The Project will improve the health status of the urban population, especially of the poor, in all the six city corporations and five municipalities to be identified. The Project will help ensure the delivery of a package of preventive, promotive, and curative health services. At least 30% of all the services provided under the Project will be targeted at the poor. The specific project objectives are to improve (i) access to and use of urban primary health care (PHC) services in the project area, with a particular focus on extending provision to the poorest; (ii) the quality of urban PHC services in the project area; and (iii) the cost-effectiveness, efficiency, and institutional and financial sustainability of PHC to meet the needs of the urban poor. The services will be designed to reduce child and maternal mortality and morbidity, and help the country achieve the Millennium Development Goals (MDGs). The Project will continue to contract out PHC services to nongovernment organizations (NGOs) through partnership agreements that were pioneered under the first Urban Primary Health Care Project (UPHCP-I). The Project will ensure pro-poor targeting by requiring that at least 30% of the preventive, promotive, and curative services provided are for the poor. Nutritional supplements will be given to moderately to severely malnourished women and children. The Project will support construction of 64 health facilities, upgrading of 4, and purchase of 12 apartments and/or buildings for PHC facilities in Dhaka city corporation. Community-run latrines and community-based solid-waste disposal will be piloted to improve environmental health, and clinical waste management will be supported. Until recently, urban PHC has been a neglected subsector in Bangladesh as in most other South Asian countries. The urban population has been growing rapidly, mostly because of rural-urban migration by the poor and the vulnerable. The absolute number of poor urban households is increasing. Studies have shown that the health indicators of the urban poor are worse than those of the rural poor because of poorer living conditions, and limited PHC. Failure to provide urban PHC can have serious negative consequences beyond urban areas because infectious diseases can spread from urban to rural areas. Rapidly growing urban slums without adequate PHC may lead to epidemics of emerging or reermerging communicable diseases. Investments in other urban services such as water and sanitation, combined with the strengthening of health services, will improve the health and well-being of the urban poor. The Project will build on the gains of UPHCP-I, and strengthen the pro-poor focus, nutrition provision, and project implementation. Although the urban populations has been increasing rapidly, the Government and external funding agencies have addressed urban PHC seriously only in the last decade. The ADB-suppported UPHCP-I and United States Agency for International Development (USAID)-supported NGO services delivery program, which contract out urban PHC to NGOs, are the only major urban PHC projects in Bangladesh, leaving significant needs for urban PCH unmet. 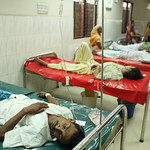 Bangladesh's health policy adopted in 2000 stresses the need to expand health services in urban areas, especially for the poor. The interim poverty reduction strategy paper and the targets sets in the Partnership Agreement on Poverty Reduction (PAPR) with ADB reflect the Government's commitment to achieving the MDGs by strengthening urban PHC, especially for the poor. ADB's country strategy supports delivery of PHC services in urban areas over the medium terms, and building local government capacity to deliver high-quality services to the urban poor, particularly women and children, in partnership with NGOs. The country assistance program evaluation (CAPE) in 2003 highlighted the need for stronger collaboration with NGOs, more effective empowerment of local communities, and support for accountable and transparent local government bodies in ADB's future programs. The Project is therefore closely aligned with: ADB's overall policy for reducing humanb poverty and helping developing member countries achieve the MDGs; Bangladesh's national poverty reduction strategy; the PAPR; the country strategy and program update; and the recommendations of the 2003 CAPE. Impact Improved health status of the urban population, especially the poor, in six city corporations and five municipalities. Progress Toward Outcome Outcome indicators with regard to improved access, efficiency, effectiveness and quality of PHC services were generally achieved. UPHCP II had a target population of 9.41 million, which was around 23% of the urban population of Bangladesh. As of 26 September 2012, 10.22 million individual clients attended UPHCP II clinics from the start of the second phase in July 2005 to June 2012 (7 years). 78% of clients were female, and overall, the project saw an increase in cumulative service contacts as well as increase in utilization among the poor reaching 80% of all service contacts in the last four years. Output 1. 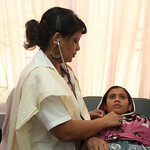 Provision of primary health care services through partner NGOs and behavioral change communication and marketing (BCCM). Output 2. Strengthening urban primary health care (PHC) infrastructure and environmental health. Output 3. Building capacity and policy support for urban primary health care. Output 4. Project implementation and operationally relevant research. Output 1.1. All the 24 partnership areas were operational until the service completion date of 30 June 2012. The PANGOs also provided interim services from July-December 2012. Output 1.2. Supplementary nutrition delivered by the 24 PA NGOs. Further strengthening of this component is required in the next phase of the project. Output 1.3. All are operational. Output 1.4. BCCM end-line survey indicated increase from 63.4% to 81.3%, compared to baseline. Output 3.1 2,945 people (1,577 female) were trained in-country, mostly in clinical or management aspects. Fellowships and study tours not conducted. At least 1 elected official from each urban local body participated in project workshop. Output 3.2. Gender composition of overseas training wasweak due to lack of more women in management positions. Output 3.3. Under-achieved, but PAs generally received training in some thematic areas. Output 3.4b. The number of women management personnel were very limited in PMU, PIUs, and PAs. Exact percentage to be verified with PMU. Output 3.5. Achieved under local training conducted by MS&T firm. Output 3.4a. Achieved for health providers. Exact percentage to be verified with PMU. Output 4.2. Delayed but four firms hired within 2 years of Project (project performance monitoring and evaluations systems; construction supervision; behavior change communication; and management and training support firm). Output 4.1. PMU and PIUs established and functioning. During Project Design During project preparation, discussions were held with beneficiaries, health staff, and officials through field studies, meetings, and workshops. These provided information on health service availability, health-seeking behaviors, and financing during disease episodes. During Project Implementation During implementation, the beneficiaries provided advice on health services, health promotion activities, and access to the health services for the poor. They were also consulted through focus groups during project evaluation. Consulting Services Consultants and consulting firms will be recruited under ADB's Guidelines on the Use of Consultants and other arrangements satisfactory to ADB for recruitment of local consultants. The consulting firms will provide (i) management support for the PMU and management training, (ii) quality assurance training and supportive supervision, (iii) health management information systems development and implementation, (iv) behavioral change communication and marketing, (v) financial management and performance auditing, (vi) project performance monitoring and evaluation, and (vii) design and supervisory engineering services for construction. Procurement of ADB-financed goods, related services, and civil works will be carried out in accordance with ADB's Guidelines for Procurement. Civil Works/Goods: The Project will construct 50 PHC centers and 14 comprehensive reproductive health care (CRHC) centers, and upgrade 4 PHC centers to CRHC centers. The Project will support the purchase of 12 apartments or buildings for PHC centers in Dhaka. The Project will support, on a pilot basis, the construction and initial operation in each partnership area of at least four community toilets blocks with bathing and urinal facilities. Partnership Agreements: The Project will continue to provide PHC services through performance-based contracting out of PHC services to NGOs. Two of the three partnership areas in Chittagong will be covered by the city corporation health department, while the remaining area will be contracted out to a partner NGO. It will use partnership agreements similar to those pioneered during UPHCP-I. The partner NGOs will provide essential services package plus (ESP+) services in the partnership agreement areas. These services will consist of (i) HIV/AIDS and STI control, (ii) other communicable disease control, (iii) other ESP services, and (iv) supplementary nutrition. The Project will finance 24 partnership agreements, each covering 200,000-300,000 people. Each partnership agreement area will consist of one CRHC center, at least one PHC center per 30,000-50,000 people, and at least one satellite or mini-clinic per 10,000 people. Satellite clinics will be operated from rented buildings in poor neighborhoods in the evening to cater to those who work during the day. PHC centers will provide a full range of essential services, including basic emergency obstetric care. The CRHC centers will provide comprehensive emergency obstetric care, newborn care, and specialized ESP+ services. The Project will support CRHC-center-based voluntary testing and counseling services for HIV/AIDS through grant financing. The Government of Bangladesh's Second Urban Primary Health Care Project, supported by ADB, DFID, Sida and UNFPA, provides increased access to primary health care services with a focus on women and children in urban areas. Local governments and NGOs come together to fight maternal and child mortality in Bangladesh.